A friend shared this with me today, and it really hit home. If you’re looking for more inspirational (and just plain interesting) quotes, this came from Quote Catalog originally. I’m going through some changes in my life at the moment, and am not really inclined to share them all here. 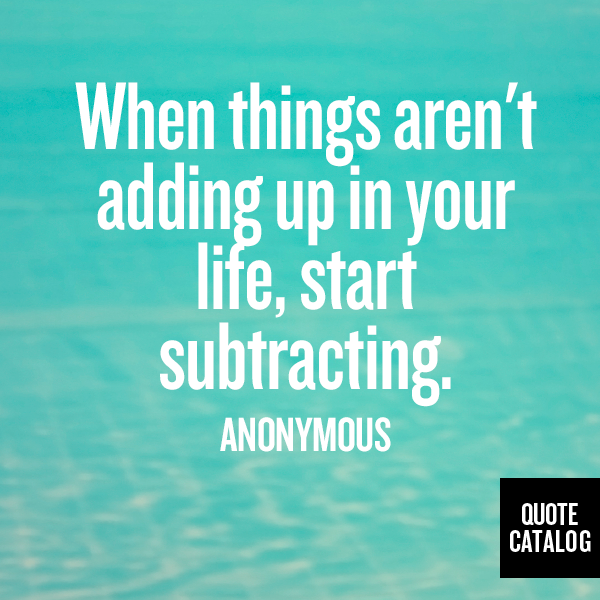 Let it suffice to say that after five years of being in some kind of awkward limbo, I’m finally taking the steps to start subtracting the useless things from my life. This is going to be a slow process, but a cathartic one. One of my main goals in life is to be helpful and to bring goodness to the world, even if it’s just through doing something small or simple. Now that I’ve typed that sentence and given it a moment to sink in, I honestly think that “simple” is definitely the way to go. Not saying “simple” as in “just gave that guy a free postage stamp,” but I guess you know what I mean. I yearn to make mindfulness a reality, and to be able to enjoy these fleeting moments in the presence of those who mean the most to me. So I’m doing a mini reboot, changing the small things in an attempt to work my way up to the biggest. It includes more yoga, less self guilt-tripping, eating organic food, avoiding processed crap, and getting rid of excess junk that litters my life – knick knacks, old books, unworn clothes, unsaid conversations. It also involves taking note of how I react and what I internalize during the day, working to speak and think in straight lines, and aiming to be treated kindly and simply by those around me – the same thing that I’ve always striven to do for them. This sounds like a sad post, overall, but really it’s a happy one. I’m a little scared, but I see so many great possibilities for my life. I don’t want to waste any more time waiting around for things to happen, or for other people to get on board with my goals. My goals will happen, and if that means that those who naysay or hinder end up falling away, it’s to be expected. A Day Of Good Things!